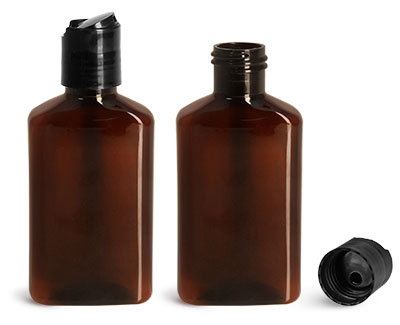 For compact dispensing choose these sleek amber PET oblong bottles with black disc top caps. The amber PET oblong bottles feature a thin, broad shape, allowing them to occupy minimal shelf space, while offering ample front and back label panels. These black disc top caps feature a .308" orifice, and can be opened by pressing down on one side of the cap. When not in use push the dispensing side down for quick and easy storing. Consider these amber plastic bottles for an assortment of bath and body care packaging such as lotions and hair care products.